Lencrow Group has taken delivery of two new FDC450S4 container handlers for the Veolia waste management site at Clyde. The container handling forklifts will be used to load 400,000 tonnes of waste annually for transportation to the Woodlawn bio reactor site where the waste will be placed in landfill cover and the gas collected for electricity production. Lencrow’s relationship with Terex goes a long way back when it was known as Fantuzzi. Lencrow purchased its first Fantuzzi machine in Australia back in 1994. The machine is still operational today at a transport yard in Sydney. Lencrow Group is also one of the sales and service dealers for the Terex range of port products. Terex Port Equipment General Manager Michael Kidd expresses full confidence in Lencrow’s ability to provide product advice to customers as well as after sales support. According to Kidd, the Lencrow team has over 30 years of experience in materials handling equipment, much of it involving reach stackers and container handling forklifts. 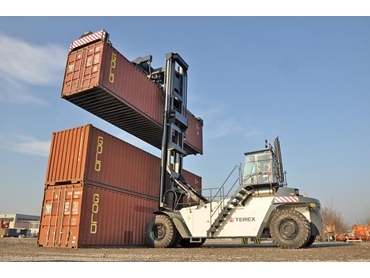 The two container handling forklifts supplied to the Veolia site suit their purpose-built 40’ containers. The units will be used in compaction as well as loading and unloading of railway cars. Managing Director of Lencrow, Ross Grassick comments that they have always been impressed with the attention to detail in the Terex machines and have found them to be very economic in their running costs.